Prior Authorization - A Legal Document? As part of the continuous harassment that is prior authorization, I recently received a form in the mail. It was a repeat of one that I had already signed and faxed in. The only difference was this boilerplate attached to the bottom"
"I attest that the medication requested is medically necessary for this patient. I further attest that the information provided is accurate and true, and that documentation supporting this information is available for review if requested by the claims processor, the health plan sponsor, or, if applicable, a state or federal regulatory agency. I understand that any person who knowingly makes or causes to be made a false record or statement that is material to a claim ultimately paid by the United States government of any state government may be subject to civil penalties and treble damages under both the federal and state False Claims Acts. See, e.g., 31 U.S.C. §§ 3729-3733." I suppose I should be grateful that the PBM in this case did not attach the 14 page federal statute. And that's right, this statute is a Civil War era statute that I am sure no legislator at the time or since then would have applied to the practice of medicine. What are the implications? 1. First is the clear alliance of PBMs with the federal government. There is no clear separation of where a private for profit business ends and the government begins. I have never sent out a form or a letter with a warning that governments at any level might enforce my recommendations or services. In fact, I have complained numerous times to government officials and agencies about managed care companies at several levels only to be politely told "We can't help you." Probably because they are tripping over one another to help out the managed care cartel. 2. Secondly (and this is a recurrent theme), we have the illusion that health care companies are policing doctors and holding them accountable. That's right - the same industry that is basically one of the largest taxes on most Americans and the same industry that has dismantled mental health care and transferred the mental health care of millions of Americans to correctional facilities. There is also an implicit threat very similar to the threat I wrote about during the billing and coding era. 3. The propaganda effect - practically all managed care intrusions into the practice of medicine are designed to shift financial and clinical risk to physicians. That would includes all of the other managed care schemes like report cards, capitation, pay-for-performance, utilization review, managed formularies and all other schemes to shift risk onto doctors. The net effect of this propaganda has been to adopt the propaganda as somehow being normative. The worst effect is that these insurance companies and MBAs push the propaganda as though it is scientific fact. It not only lacks scientific merit but they frequently do not know how to analyze the data. The best example I can think of is using the PHQ-9 to "measure" depression treatment in the state of Minnesota. This is not only an invalid application of the screening tool, but the state clearly does not have any way to analyze the longitudinal data in any scientific manner. Future of psychiatry may depend on integrated care. I would submit that it does but not for the reasons claimed in the article. Integrated care will result in psychiatrists with considerable less knowledge than they currently have and they will be totally marginalized without a clear set of problems to treat. The only reason psychiatrists have not been put out of business so far is that we successfully treat a set of problems that nobody else does. Standing around in a primary care clinic looking at PHQ-9 scores and monitoring the rapid and random prescription of antidepressants by nonpsychiatrists seems like a job for an MBA rather than an MD. I caught a story about the marketing of legal marijuana on public radio yesterday that was predictable in its content. It is always interesting to observe human behavior when it comes to selling a potentially addictive intoxicant. Suddenly - people with no interest or aptitude for science and medicine become "master growers" and gurus of the medical effects of marijuana. It takes on an eery analogy with the business types who have taken over medicine. Money gives you immediate legitimacy whether you know anything or not. And really - how much do you have to know to grow and sell pot? Feign a little concern and market it to everybody - just like tobacco. In all of the agitation about "medical marijuana" and the gnashing of teeth in state legislatures across the land, I guess nobody was anticipating that there will now be a branding and marketing emphasis on weed. How do you determine if 30% or your audience is minors? The MPR story illustrates how some dealers want to differentiate their product by the people who use it. They want to make sure that they are attracting more than "stoners". Put it in an upscale store and market it like fine wine. Having gone from Cheech and Chong comedy albums and movies in the 1970's to weed as a serious product is a mind expanding experience for people from my generation. Besides getting used to the concept there are probably a couple of other things for consideration. It seems to me that the DOJ anticipated some of this activity with medical marijuana. I have not seen any specific guidance on legal marijuana for non-medical purposes. What about the economic effects? Will marijuana dispensaries become as common as liquor stores and if so does the economics of liquor stores have any implications? Lotterman points out that liquor stores are intensely competitive businesses and no one seller has enough leverage to increase the price. Demand is also inelastic and that means that the amount purchased does not vary significantly with any initial price increases. Inelastic demand also occurs with food and emergency medical services. Buyers tend to not postpone purchases based on price - at least initially. As a result the businesses have low margins due to competition but fairly high volume and it does not take much to impact their profitability. The article is written about the potential impact of of a law that keeps liquor stores open on Sunday. Lotterman also talks about the cost to society of keeping the liquor stores open on Sunday. I think that marijuana dispensaries and the dispensaries of whatever other drug the politicians legalize will eventually resemble the liquor store scenario with a proliferating collection of low margin businesses. It will take a while for the market to get to that level, largely due to the folklore associated with the product at this point in time. Why is this model important? Two reasons really. The first is the current marketing angle. The marijuana entrepreneurs want to expand the market including expanding it to people who are not using the product. Secondly will be the level of availability. If we are looking at the liquor store model, each establishment will have to move a large amount of product to stay in business. That will involve a range of product analogous to expensive wines and liqueurs in fancy bottles to the inexpensive vodka that is the mainstay of alcoholism. Few people will get rich, In many ways it will be similar to the Freakonomics analysis of why it is hard to get rich selling crack cocaine. In the end, high volume low margin business benefits the few and not the many who may end up taking the risks. It is the ideal low cost mechanism for maximizing exposure of the product to the most people. I expect the learning curve on all of this to be high. As I have watched the reality TV shows about this phenomenon as well as the dramatic adaptations like the television series Weeds it is clear that the goldrush myths are alive and well. The product is hyped as being benign and it will be widely marketed. It doesn't take a lot of imagination to predict that there will be crime activity associated with the overall process. 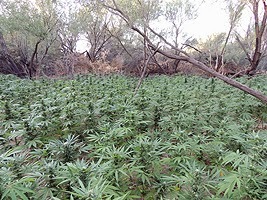 The idea that addictive intoxicants can be removed from the sphere of criminal activity so that we can all enjoy the benefits of getting high and spending the increased tax revenues is a recurrent fantasy. There is significant criminal activity associated with the legal drugs - alcohol and tobacco and they have their own agency to deal with those problems. Edward Lotterman. The Cost of Sunday Liquor Sales. March 16, 2014. Luke Runyon. To Keep The Business Growing, Vendor's Rebrand Pot Stoner's Image. Minnesota Public Radio. April 21, 2014. (listen to the link). Steven D. Levitt, Stephen J. Dubner. Why do drug dealers still live with their moms? in Freakonomics, Harper Perennial, New York, 2005, 2006, 2009: 85-113. Supplementary 1: I intentionally avoided any reference to the medical costs of cannabis even though we know more about that now than at any point in history. There have been some high profile stories recently but the most believable one should come from long time cannabis advocate Tommy Chong during an interview on TMZ a few weeks ago. I personally saw the video in real time where he comments that pot is not for everybody and that some people should avoid it. That is a paraphrase. I thought the actual video would be out there but it is not. Probably too much at odds with his other videos. 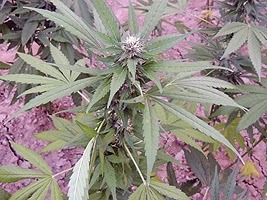 Supplementary 2: Public domain photos of marijuana courtesy of U.S. Department of Justice Drug Enforcement Administration. Supplementary 3: It will be an interesting twist if cannabis is marketed as anything but a drug. That will be the difference between direct-to-consumer pharmaceutical ads where the consumer is rapidly advised of a string of significant side effects (including the possibility of death in some cases) and some ads contain the phrase: "this drug is not for everybody" and an ad for an alcoholic beverage that says "drink responsibly". The latter by definition will result in broader exposure for a larger number of people. Supplementary 4: I was just (4/30/2014) informed by a reader from Colorado that medical marijuana is still the preferred product there because the taxes on it are lower. 1. Unconscious Motivations: This is one of the areas that I consider to be the primary cause. It encompasses both unconscious and preconscious causes. The best way to look at it is with a few examples. Overidentification with the patient seems to be a fairly common cause. For example, a physician might have attention deficit hyperactivity disorder and realize that they were able to do much better academically. They have a lower threshold for seeing the problem in others based on their experience. In their medical group they are seeing many more ADHD patients than their colleagues and prescribing far more stimulant medications. That is really a special case of the physician wanting to do something positive for the patient. That can lead to a reduced awareness of other causes such as substance abuse or a person seeking cognitive enhancement and drive the prescription process. The wish to be appreciated and have a positive relationship with the patient is another issue. Consider the patient in clinic an uncomplicated upper respiratory infection. Near the end of the clinical encounter, the patient senses that there will be no prescription and starts to get annoyed. The patient talks about his or her past experience and how an antibiotic always seems to clear up their cold symptoms. They put the physician on the defensive about the antibiotic issue and rather than argue with the patient - the physician hands over the prescription. All of these scenarios and more reflect unconscious factors involved in prescribing and as far as I can tell this important area is untouched in the overprescribing literature. 2. Medical knowledge: This occurs at two levels. The first is just the rote declarative knowledge that involves the memorization of factual knowledge about medications. This seems like a fairly basic skill, but the amount of information we are talking about is encyclopedic. To illustrate this all one has to do is to pull up recent FDA approved package inserts for drugs that are advertised on television. All of the pharmacological details are presented in a neutral and highly detailed manner. There is some prioritization in terms of contraindications and precautions, but that is still a lot to memorize. 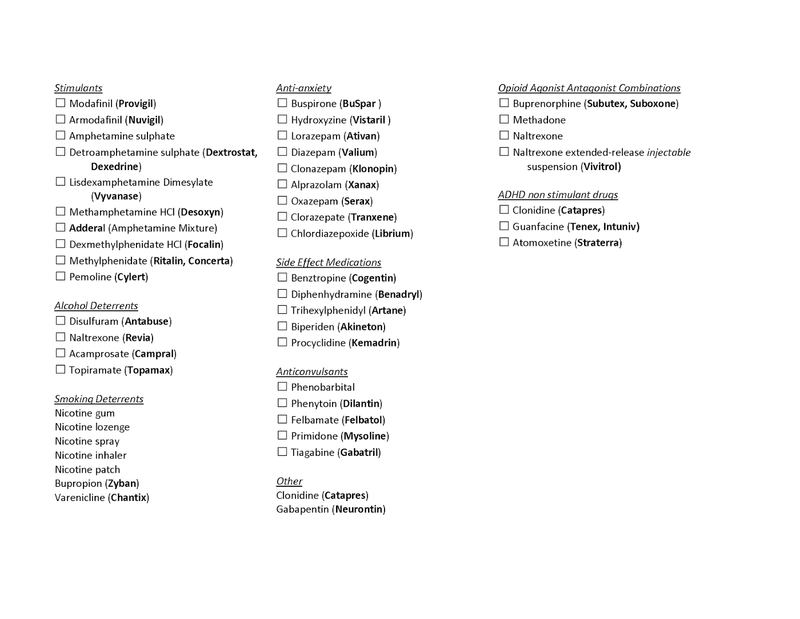 Experienced clinicians will still read these documents repeatedly and use summary references until they gain enough experience with the medication. The second level is the patterns that become familiar when using the drug. For example, after I have prescribed a drug enough times, I can tell anyone taking it what my experience with the medication is and what the experience of my patients has been. That information is really not available anywhere else and it also can lead directly to additional testing. 3. External validation: The best objective source of external validation is prescribing medications according to the FDA approved indications and as instructed in those documents. Off labels prescriptions should be backed up by some data. I typically research all off label prescribing by doing Medline searches and looking for actual clinical trials looking at that application. Example would include looking at the use of gabapentin for chronic pain and treatment of alcohol withdrawal. Even though there are no FDA approved applications, there is ample evidence about how to use these medications, including very specific dosing recommendations. 4. Conservative prescribing bias: My goal has always been to treat the primary problem but also eliminate or minimize problems related to the medication. That is not the goal of some physicians. I heard an expert in the treatment of anxiety disorders suggesting that patients needed to be treated to the point of toxicity with a medication and then the medication could be reduced. That is not necessary as far as I can tell. Another issue here is exceeding the FDA approved range for medication use. Quality markers for dose range and multiple medications from the same class are nothing new and date back at least 20 years. This information that is also part of informed consent and the patient should hear about it and other options at the time the change is being considered. I have spent a lot of time correcting unnecessary high doses and polypharmacy, generally to the benefit of the patient involved. 5. Social context: A group of interested physicians who keep up on the research and analyze prescribing patterns is a robust safeguard against overprescribing. There are some setting for example where benzodiazepines or benzodiazepine related sleep medications are not prescribed in any circumstance. Stimulant medications are used only by review with a colleague and the medical director and documentation on a signed form. Such a review procedure is available to any group has utility in preventing variation in prescribing patterns and practice variation. Practically every major clinic and hospital has a program that targets antibiotic overprescribing especially the overuse of expensive, toxic or antibiotics that are the last defense against bacteria with multiple drug resistance. This social factor is a powerful safeguard against overprescribing. 6. Physician as a source of information and teaching: If the physician is in a position to teach patients about a medication they generally have a more nuanced knowledge about the medication. They avoid stereotypes like: "When I see this problem I always prescribe this drug." They are also aware of the likelihood of the patient recovering without the drug and the fact that any drug effect make be weak. A classic example is low back pain in adults. Patients generally lack knowledge about the importance of avoiding deconditioning and the need for ongoing physical therapy and back specific exercises. They are generally surprised that conditioning provides a significant amount of pain relief. These are a few brief examples about what can be done. All of these dimensions occur in the context of political and regulatory influences. For example, the FDA initiatives to approve potent opioid medications that are essentially not much different in terms of risk from current medications during an opioid epidemic. Guidelines suggested by outside sources may not be very useful if there is insufficient evidence and the information is broadly disseminated to clinicians. The bubbles listed on the diagram are potent factors in countering any trend that may lead to oversubscribing and they do not involve penalizing or threatening physicians - typical actions used by law enforcement or politicians that may have caused the problem in the first place. The reader will note that I am not concerned about diagnostic proliferation. I don't think that overprescribers do this based on the availability of new diagnoses. I base this on my observations of the patterns that exist independently of new diagnoses and can provide a number of examples. Physicians are trained to "do" something medical or surgical and over the course of my career that bias has not panned out in a number of areas. Targeting that tendency will be more productive than complaining about pharmaceutical companies, diagnostic manuals, or guidelines especially when our major regulatory agency has the bias to get a drug out there for general use based on highly variable scientific evidence. As recently noted the FDA can also ignore the recommendations of their own scientific committee. In the end, the best assurance of adequate medical treatment and minimal risk from the treatment depends on the expertise and judgment of a physician. Supplementary 1: After staring at the diagram for a while I think I need to add a 7th Bubble that I would probably call "Heuristics". It would focus on the cognitive and emotional biases that exist in prescribing. For example, everyone in their practice may have a person with an addiction who was subsequently able to take an addicting medication without relapsing to their primary addiction. Is that a reason for making that a rule for prescribing? There are a number of ways to look at potential biases in prescribing that can improve the evaluative structure of that process. I felt compelled to get this down because the continued wheel spinning on this subject is really starting to annoy me. People are wringing their hands like they either don't know what to do or they angrily invoke some model that suggests a solution but not really. The two common models invoked are the "medicalization" of society and the other is some sort of conspiracy (Big Pharma, psychiatry) to invent diagnoses and indications for prescribing medications in order for Big Pharma to make more money. The recipients of all of the overprescribing are seen as hapless victims who never stood a chance in the face of the medicalization-conspiracy juggernaut. All we have to do is stop the Big Pharma-monolithic psychiatry steamroller. Some of the "solutions" to this dilemma are equally far fetched. First of all lets say that any physicians affiliated with Big Pharma in any way need to report all of those connections. There was recent evidence posted that this was not slowing down physician interest in these jobs - temporary or otherwise. It is after all a free country and one where you have to make money to survive. Physician compensation is dropping as the workload goes through the roof. The reimbursement and hassle in psychiatry is so onerous that psychiatrists are the least likely speciality group to accept insurance. Many physicians would like nothing better than to work for a pharmaceutical company. So the lack of slowing down is certainly no surprise to me. Those who are naive to the way transparency works probably thought that physicians would be too ashamed of their appearance of conflict of interest. That is after all what we are talking about - an appearance of conflict of interest. The prototype for transparency is the US Congress whose members blatantly take money from and provide easy access to the same industries that they regulate. If transparency doesn't slow down Congress, why would it slow down physicians who are often in positions where they are actually being paid for rendering a service to the company and there is no evidence of quid pro quo. Another solution is to isolate physicians and trainees from pharmaceutical company representatives and promotional materials. Probably some of the weakest research in the history of the world is the research that shows that pharmaceutical promotions and advertising influences physicians to prescribe drugs. The only weaker research is that Maintenance of Certification measures are worth the time and effort. Not only that but by now it should be pretty clear that throwing pharmaceutical reps to the curb has not diminished the overprescribing of just about anything. Practically all of the over prescribed antibiotics right now are generics. The same thing is true of the overprescribed benzodiazepines and antidepressants. As far as I can tell most of the overprescribed opioids are the usual hydrocodone/oxycodone and acetaminophen preparations and 30 mg generic oxycodone tablets. Pharmaceutical company detailing has nothing to do with why all of these drugs are overprescribed. Every hospital and clinic has a Pharmacy and Therapeutics Committee responsible for a formulary and they often have specific strategies to reduce costs associated with the most expensive drugs on that formulary. I spent over a decade on two different P & T Committees. I have never seen any member try to push through a drug - past about 20 physicians and PharmDs, based on a piece of pizza or a donut that a pharmaceutical rep gave them. Even thinking that could happen is absurd. What about the DSM-5 conspiracy? What about the bereavement exclusion? Won't that open up tens of millions of mourners to the hazards of antidepressant medications? Only if their primary care physician is fairly clueless. As I have previously posted psychiatrists have studied the problem and the solutions that Paula Clayton found 40 years ago are no different than today than they were then. It certainly is possible that treating rating scale results can increase antidepressant prescribing. But that is currently considered state-of-the-art measurement based care by managed care organizations and some governments. That is a clear force that facilitates overprescribing. What about cognitive errors? Do physicians really overprescribe because they lack the technical knowledge on how to prescribe? I really doubt that is the problem. I would cite the case of overprescribed antibiotics. During my training and for many years after the Sanford Guide to Antimicrobial Therapy was considered definitive guidance for antibiotic therapy. As HIV therapy increased in success and complexity an accompanying manual The Sanford Guide to HIV/AIDS Therapy came out. Every medicine and surgery house officer and many staff counted on the microscopic type on these pages for definitive guidance on prescribing antibiotic and antiviral therapies. It was just a question of identifying the pathogen, determining if the patient could tolerate the medication, and prescribing the drug as recommended. So how is it possible that antibiotics are overprescribed? So what are the real reasons for overprescribing? The overprescribing literature extends back well over 20 years at this point. Solutions are not readily found. That literature generally comes down to particular class of drugs and the progress in that area. I recently reviewed the REMS strategy to the current opioid problem and why I did not think that would work. It really comes down to two things and neither of them has to do with a diagnosis or medicalization. The first is that health care systems are currently set up to offer some type of test or pill as a solution to most problems. At least when they are not claiming that they are responsible for your cradle-to-grave health and giving you a gym membership discount. All of that goes out the window when you enter the clinic and have 5 or 10 minutes with a doctor. In the case of mental health care, many of the conditions that present in primary care are better treated with psychotherapy than with medications, but most primary care physicians are not trained in psychotherapy. Some are trained in motivational interviewing, but to suggest that will be successful in many of their patients is really an insult to the problems facing them. Primary care physicians see patients with very difficult refractory problems. These patients will see a specialist once or twice and then go back to their primary care physician for care with the same difficult problems. Not overprescribing in many of these situations is really a question of limit setting rather than motivational interviewing. That is especially true if the prescription is a drug that is addicting or can cause an altered state of consciousness. The other issue is that systems of care these days, are set to run on the concept of customer satisfaction rather than excellent medical care. The idea that a customer may not get what he or she wants is anathema to the MBAs that are currently in charge of the system. The trickle down effect is that the physician who is setting limits on benzodiazepine, sedative hypnotics, stimulants, or opioid prescriptions will not get good customer satisfaction ratings and their compensation and role in the organization may be diminished as a result. Health care systems that allow patients to rate their doctors on satisfaction ratings without considering that patients might be dissatisfied with reality should be held to task. The second factor is the physician himself. 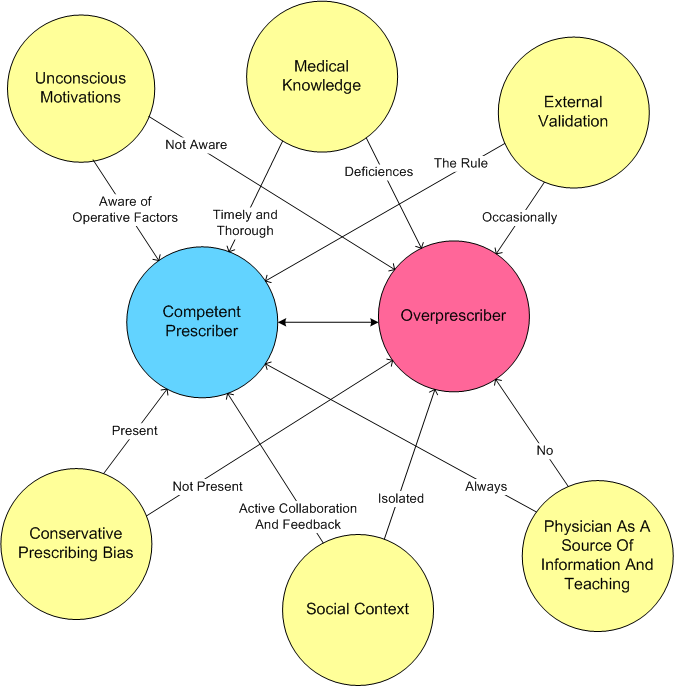 How many physicians have thought about all of the unconscious factors that lead to their overprescribing? My guess is not many. The problem of overprescribing is viewed as an informational deficit. It is believed for example that teaching physicians all about chronic pain and the pharmacology of opioids will somehow reduce opioid overprescribing. I don't see how anyone can come to that conclusion. All physicians are taught pharmacology and most have experience prescribing opioids. That approach seems as naive to me as the Joint Commission pain initiative in the year 2000. Physicians need to determine for themselves why they are uncomfortable not giving a patient a prescription for whatever they are asking for. I have heard a wide variety of reasons in my career and most of them have nothing to do with the indications for the drug. The majority had to do with the physician believing that they could do something to alleviate the patient's distress and that wish was independent of what the diagnosis or indication for the drug was at the time. The new variation on that theme is that physicians are somehow capable of overcoming the effects of a chronically impoverished environment, severe ongoing adversity, and either an inability or a resistance to change by prescribing a drug. That is basically the same rationale that people use when they are addicted to drugs and alcohol. They hope to use something to block out reality for a few hours. Overprescribing will not change that. The other interesting consideration is that the diagnosis is irrelevant. It is tacked on afterwards for a prescription that is written for no real medical reason. There needs to be better standards for determining what constitutes overprescribing and what does not. I recently corresponded with the lead author of a paper looking at the issue overuse of health care services in the US (see reference 2). The authors conclude that while there is ample evidence of overuse, the scope of research is limited. Some of this is due to difficulties with definition and that would apply to the issue of overprescribing psychiatric medications. The studies that frequently make the headlines have significant methodological problems. A study I recently posted used two different data sources to conclude that antidepressants were being overprescribed. The studies need to be more than prescription, survey and administrative data. Those studies will necessarily be labor intensive and expensive. In the end, I always come back to the informed consent model. If the patient is competent to consent in most cases the physician and patient can have detailed conversation about the prescription including the risks and benefits and what it would like to go without it. These are usually lengthy conversations. These are tough decisions based on the fact that nobody wants to take medications regularly or see doctors for the purpose of continuing medications. My own personal experience is consistent with what my patients have told me over the years - some change is desperately needed and that is often how the medication is viewed. In that context people will often try medications with significant toxicity. The medicines advertised on TV with death as a stated side effect are cases in point. But no matter how much information passes, the physician needs to be the ultimate judge of whether the medication is a good idea. It can never be a decision that is taken lightly. Supplementary 1: I was going to add a detailed explanation of my bubble diagram to this post but it is too long. Look for a separate post about the bubbles. Supplementary 2: An updated higher resolution bubble diagram is located at this link. Responding to Jim Amos' post on what keeps us all going led me to recall some of my most valued conversations with colleagues and what happened to those conversations. I began working at a major hospital in the Twin Cities sometime in the late 1980s. These conversations happened sometime in the 1990's. At our hospital there was a large cafeteria are in the corner of the building so that it it was bordered by windows to the exterior on the north and east sides. One the far east side was a separate room about 1/8 as large as the entire space that was reserved for medical staff. It was separated by a door from the main cafeteria, but the door was usually open unless there was more noise than usual in the main room. At one point the GI specialists were all seated at one table. I knew all of them from consultations they had done on my patients and one of them from medical school. We had both been in the very first class (Biochemistry) together. After a while we all routinely met there. We were joined from time to time by several Renal Medicine, Endocrinology, and Infectious Disease specialists. The occasional Cardiologist or Surgeon would drop by. We talked about movies. I recall one of the films we were discussing was Sylvester Stallone's Cliffhanger and that would have put that conversation sometime in 1993. One of the discussants was an expert in hostas and he often talked about that botanical speciality. We spent time talking about pancreatic cancer, imaging studies, narcissistic personality disorder, dementia, psychosis, and futile care and what could be done about it. The conversations were lively. Plenty of self deprecating specialty specific humor. Most of the people there had a good sense of humor. We discussed topics that were both serious and not serious in a calm and even manner. I looked forward to those lunch meetings. It was a chance to talk with colleagues in an open and relaxed manner. Nobody was bleeding to death or unconscious. There was no pressure to do a last minute consultation before everybody left the hospital. More importantly there was none of the nonsense you might encounter let's say on the Internet. There was no one upmanship. No moral hypertrophy. No discussion focused on the superiority of one speciality over another. Reading the internet gossip, it might be hard to believe that doctors buy their own meals and don't spend every waking moment plotting about how they can use the newest heavily promoted drug. In fact many of the conversations were focused on just the opposite. I can recall reading a critique of heavily promoted acetylcholine esterase inhibitors for Alzheimer's disease (AD) with some primary care internists. The asked me what I thought of these drugs especially the most recent billion dollar drug. I have been involved in AD drug trials, the initial clinical application of tacrine and the subsequent approved drugs. I thought that their effects were undetectable. The internists agreed and one of them said: "Leave it up to the pharmaceutical companies to invent a rating scale that works for their drug but has no clinical meaning." None of us wanted credit or acclaim for that commentary. None of us claimed we were keeping Big Pharma honest. We we just clinicians comparing notes and agreeing that a certain class of medications was not as effective as it was advertised to be. In this group we had many of these conversations. Things suddenly changed when the administrators decided to erect a new building along the east side of the existing hospital. Suddenly the view and windows were completely gone. Sitting in the doctors section was like sitting in a cave. At about the same time, we were all told to report to coding seminars and warned that we could be charged with a violation of the RICO statutes if it was found that we were submitting "fraudulent" billing. Fraudulent billing was basically either billing that somebody said was fraudulent (there was and is no objective criteria) or countersigning a resident's note and not doing enough documentation to actually prove that you had seen the patient. Proof for the purpose of that seminar was basically doing identical documentation as the resident. When I heard that I could end up in a federal penitentiary I took the new billing and coding guidelines seriously. Over the next few years the documentation burden went through the roof. That resulted in me no longer working with residents. They were angry about the degree of documentation they saw me doing and thought it reflected on their work. No matter how many times I said: "No this is me trying to stay out of federal prison" it did not assuage their anger. I suppose it sounded incredible - even absurd. But my billing, documentation and coding was actually reviewed based on those standards for years. That was such an obstacle at one point I decided that it was easier to work by myself. There was no time for teaching anyway due to the documentation requirements. My colleagues were under similar constraints. People just stopped showing up for lunch. I would run into one or two in the hallway from time to time. The administrators were also actively involved in moving my colleagues around. Many did not like it and some of them left. I had the feeling that if we were left to our own devices and kept things running the way they had been running for years, that we would still be meeting at noon and having the same discussions we had in 1993. But there was no such luck. The last time I saw one of my colleagues was about 5 years ago. We met in the hallway of the same hospital. We were both thinking about that Stallone movie. A curious thing happened about 10 years later. Some administrator had the brilliant idea that a "doctors' dining area" made sense. They separated it completely from the cafeteria. They made it more high end to attract the doctors back in the place. I even met up with some of my previous colleagues there from GI and Renal Medicine. The conversations still had the potential to be inspiring. But something was gone forever. There was no time for collegial conversation anymore. Most of us were fairly isolated as a result of how the practice had changed. It was forever transformed by corporate America. Doctors no longer seemed like inspired people on a life long mission of patient care and education. And we all knew this could disappear as easily as it materialized. I had travelled up to northern Minnesota at one point and went down into an old iron ore mine. 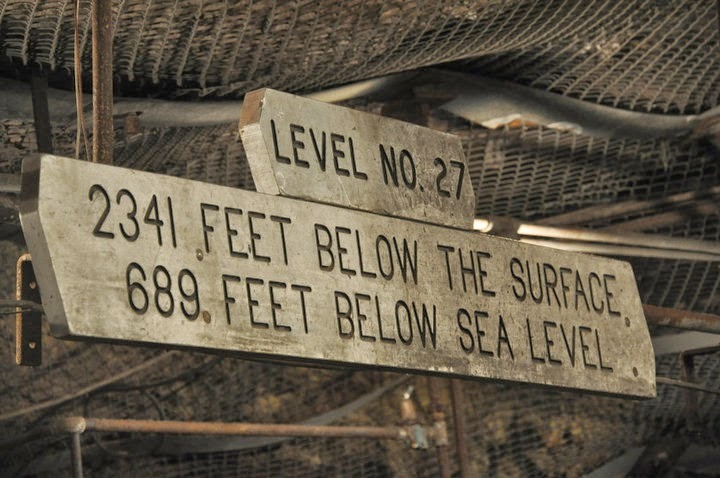 There 2,300 feet below the surface was a lunch room. It was inside a steel cage to protect the miners from cave ins. I could imagine people working all day a mile below the surface, covered in iron ore dust, and eating lunch in that room. For a minute I pictured myself as one of those miners. Brutal unending work in the worst of all conditions. At one point the tour guide shut off all the lights to demonstrate what it was like lit by carbide lamps on helmets. We were in a large room about 100 x 100 feet with a 20 foot ceiling. The floor was visible in a dim arc about 5 feet in the distance and everywhere else it was pitch dark. Miners actually worked like that before electricity and only a few of them had carbide lamps. It was depressing. Then we learned that before carbide lamps, the miners used candles. Even more depressing. I felt that medicine had taken a step in the direction of the old iron ore mine. I enjoyed seeing my colleagues every day. I enjoyed and learned from what they had to say. If I needed to go to a hospital or clinic in the future I would want to go to one where there were collegial conversations every day. But I suspect those places are few and far between. Supplementary 1: The billing and coding seminar described here actually happened that way. At the time the FBI was raiding practices and they made some of these decisions. In internal reviews I went from the best documentation one year to the worst the next even when I had not changed a thing. Eventually the FBI decided there were probably better thing to do than enforce a purely subjective standard against doctors who were hardly engaged in criminal or terrorist activities. The out for most organizations was to have an internal compliance department to do the same reviews, After about 10 years, documentation with residents returned to nearly what it used to be and I could resume teaching again. I can still recall when I was referred to my first web site for a prior authorization of a prescription medication. My first thought was: "Great - I am going to have to open up an account somewhere so that I can work as an uncompensated employee of a PBM." It wasn't quite that bad but it wasn't good either. Online prior authorization request are often hyped as the solution to the ongoing physician harassment by PBMs. They claim to be faster that the usual fax or telephone methods. From the scenario I recently posted it is hard to believe that they could be any slower. In this case I had to be the data entry person and enter data from a fax from the pharmacy and the demographic section of my EHR onto two computer screens. After establishing that all of the correct releases were in place, that involves going between these screens and supplying data that physicians typically don't ever use and therefore do not care about. In this case it was health insurance data - the group number and name of the policy. Remind me why I went to medical school again. Luckily I work with an excellent staff, but it meant getting up and finding the right person to get me this information. I can imagine that there are a number of settings where it might not be listed. In that case you cannot complete the form. It just locks up there in cyberspace and does not allow you to complete and submit it. The form is actually a request for prior authorization and you have to do it even if the patient has been taking the medication for some time. In the previous post I pointed out that some members of my state psychiatric society had developed a form that included data on previous medications from the class in question that were either not tolerated or failed. Of all of the people I have seen, there are very few people who can provide that level of detail over any 10-20 year span of medication trials for disorders than can affect memory and motivation. I usually provide a checklist to prompt people as shown below. In many cases there are surprisingly few responses until I show them the checklist. 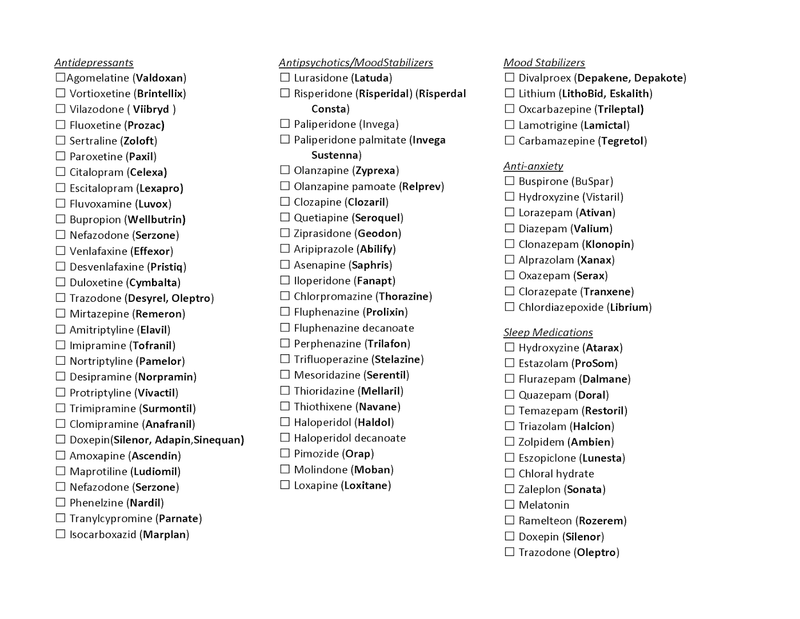 Medication names are basically medical jargon at its best, and people outside of any field who are unfamiliar with the jargon are less likely to recall these terms. Filling in the past medications for a prior authorization is problematic for that reason. Filling it in is also problematic if the patient has been seen for years. Somebody still needs to go in and search for the medications. Most EHRs have poor search capability for classes of medications and even if there is one table somewhere it will not say whether the medication failed or was not tolerated. Without that information the form cannot be completed. With the wonders of the Internet and computers, prior authorization remains a waste of time. The forms are not designed for physicians to complete and the human factors involved still require a lot of time. No physician I know has 20 - 25 minutes to waste on form completion for every moderately priced prescription that they write. No physician I know has that kind of time to waste irrespective of the cost of the drug. The phenomenon has been studied to some degree (1) and the actual costs are very high. One study showed that physicians spend at least 35 minutes a day on this activity and required 0.67 FTE non-clinical staff per FTE physician. The total annual cost of the physician and non-clinical staff time was $85,276. That is nearly 4 times as much as Canadian physicians (2) and I am guessing that most of that is due to prior authorization. That translates to an annual figure of $23 to $31 billion dollars annually (3) to medical practices in the US. When I say that I have done a lot of free work for managed care companies and PBMs I am not kidding. There has been some additional data available about prescription drugs used for psychiatric indications in a report from SAMHSA (4). 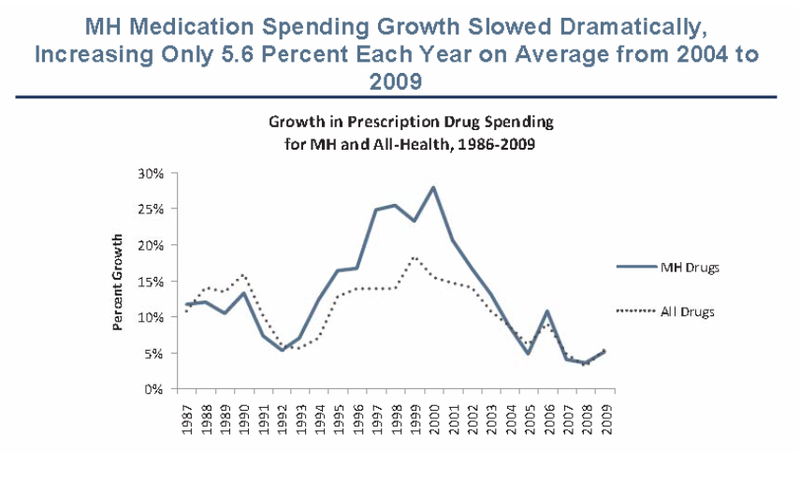 I think that it is apparent from the graph that the growth in medication spending is more likely to be due to patent protection of name brand medications than excessive prescribing of expensive drugs and the pricing structure of specific pharmaceutical companies. For a graphic showing some of these patent expirations check out this link. I can recall the clozapine prior authorization procedure in this state when it first became available in the 1990s. Clozapine prescribing was limited to registered psychiatrists and for every prescription you had to call a PharmD in the Department of Human Services and recite the diagnosis and white blood cell parameters. It did not take long to realize that the expense of the drug and the associated monitoring was not a determining factor in the prescription of this medication. The argument has been made by some that clozapine was not used when it might have been useful because of the barriers to prescribing it. Those barriers have been widely recognized by psychiatrists and the prior authorization was not a determining factor. It was discontinued in about 2 years and most of the companies who currently handle it have an expedited enrollment in their registry that is faster than most medication prior authorizations. If PBMs want to reject pharmacy claims they can do it easily on business grounds rather than involving physicians. They can also just charge a high copay. This is clearly a high cost problem to physicians, clinics and hospitals. Eliminating it would result in more saving than the mythical electronic health record dividend. 1: Sakowski JA, Kahn JG, Kronick RG, Newman JM, Luft HS. Peering into the black box: billing and insurance activities in a medical group. Health Aff (Millwood). 2009 Jul-Aug;28(4):w544-54. doi: 10.1377/hlthaff.28.4.w544. Epub 2009 May 14. PubMed PMID: 19443478. 2: Morra D, Nicholson S, Levinson W, Gans DN, Hammons T, Casalino LP. US physician practices versus Canadians: spending nearly four times as much money interacting with payers. Health Aff (Millwood). 2011 Aug;30(8):1443-50. doi: 10.1377/hlthaff.2010.0893. Epub 2011 Aug 3. PubMed PMID: 21813866. 3: Casalino LP, Nicholson S, Gans DN, Hammons T, Morra D, Karrison T, Levinson W. What does it cost physician practices to interact with health insurance plans? Health Aff (Millwood). 2009 Jul-Aug;28(4):w533-43. doi: 10.1377/hlthaff.28.4.w533. Epub 2009 May 14. PubMed PMID: 19443477. 4: Substance Abuse and Mental Health Services Administration. National Expenditures for Mental Health Services and Substance Abuse Treatment, 1986–2009. HHS Publication No. SMA-13-4740. Rockville, MD: Substance Abuse and Mental Health Services Administration, 2013. Supplementary 1: I received a prior authorization fax today about two weeks after the original post. It contained a number of checkboxes that were very crude approximations of the decision making process for prescribing the drug. Since the strategy itself serves no useful purpose, I continue to conclude that this is a process designed to slow down and possible thwart the prescription process for an FDA approved drug, simply because of high cost. Any delay involved makes it less likely that the patient will pick up the prescription and increases the likelihood that the fax will get lost in the process. I heard a very compelling story on MPR Marketplace last night about crowdsourcing. They interviewed the founders of Gustin denim and their new method for selling blue jeans. The old way that most of us are familiar with is to design a certain type of blue jean or brand and then market that product to the public. That marketing consists of convincing the public why they need the product. There are many inefficiencies associated with that model including the fact that it is very difficult to match the product with the customer and there are charges for various middlemen added along the way. Josh Gustin and his business partner Stephen Powell decided that there was a better way. They decided to post fabric swatches and describe what they intended to do with it in terms of fabrics and then have prospective customers support these various "campaigns". When sufficient number of subscribers was signed up they would produce the products. The outcome of this process is highly efficient in that there is no wasted fabric for the manufacturer and no mark up for the customer. These essentially custom blue jeans sell for $81 wholesale and are marked up to $250 by some retailers. That allows the wholesaler to maintain the same margins by selling at the wholesale price. What a deal all around. Of course the first thing I thought of was this is an ideal way to match psychiatric (or any medical) services to what the public wants. It would be a clinic or a coalition of independent providers. Instead of being locked in to visits determined by billing codes that don't really match very well with what patients or physicians want, the entire spectrum of services could be offered. The pricing structure might be a little more complex if various insurances are factored in but consider the ideal case of no insurance and strictly cash payment. There is often a lot of confusion over how long the visits last and what exactly happens in the visit. As an example, it is common for patients who are used to seeing a psychiatrist for 30-60 minute visits suddenly going to a different clinic and being told that they can see the doctor for only 10-20 minutes. They have similar problems with frequency. Even in an initial assessment, the patient may have an expectation that they have 90 minutes of history only to be told that the doctor only sees people for 40 minutes and uses the last 20 minutes for dictation. A menu of services could be offered on an ongoing basis with a critical mass of subscribers determining any significant changes. I would also have a menu of consult questions and conditions of varying complexities. This would be quite an exciting approach given the state of outpatient services and how they are currently determined. I mentioned a completely unrealistic set of billing codes as being one determinant. Do you need to see the doctor for a "med check"? The other is managed care and their unrealistic productivity and rationing demands. If a person is being seen in a clinic where every doctor is allotted 10-20 minutes they may appear to be poised over a prescription pad rather than being a source of information and discussion. Some services that would be in demand are not even offered and the justification is that they are "not medically necessary". It should be possible to offer the rationed version of services along with a more complete version of what people may want. I would also tend to list research proven services. One of the main problems is that psychotherapy services are often in the mind of the therapist. I have listed several research proven approaches on this blog. When I talk with people who I have assessed about what I think they need, I discuss psychotherapies that have been proven to be effective for their particular problem. The difficult part is for them to find a person providing that kind of therapy. If should be clearly listed rather than referenced as an interest in the employee bio section of the clinic web site. Some people (like managed care executives and the government bureaucrats who support them) will say that we cannot give patients this level of input into the design of psychiatric or medical services. It will just not be cost effective and they will be asking for many "unnecessary" services. In my experience talking with people over thirty years that is clearly not the case. It turns out that most people are reasonable and make rational choices. Some people will insist on the shortest and most cost effective approach. Others realize that they get a lot more out of discussions than a prescription. They find that even a 20 minute conversation about a medication is not long enough. Some want to show up with a written list of problems for discussion and they don't want to be told that they need to set up separate 10 minute appointments for each problem. Everyone has an expectation of service and I can't imagine that most people are currently getting it. With crowdsourcing customer satisfaction would no longer be a joke. Customer satisfaction would start with the design of services and their availability rather than a scripted survey designed by a managed care company to make them look good. How else can you end up rating suboptimal, highly rationed and inaccessible services highly? Aren't 95% of all managed care clinics and hospitals highly rated? We are all unreasonably taxed for health care services. It is time to let the crowd design what they want. They are paying a very high price for it. Supplementary 1: I hope to come up with crowdsourced menu and post it here in the next few days. Anyone who has read this blog in the past is aware of my opinion of middlemen in health care and how they waste everyone's time and run up costs. Pharmacy Benefit Managers (PBM) remain there right up at the top. The PBM is the company that your doctor calls to get authorization so that an insurance plan will pay for all or part of a specific prescription drug. It has never been more clear to me that their sole function is to be an obstacle to the physician, the pharmacist and the patient. The goal of that obstruction is to increase the likelihood that anyone of those parties will give up at some point and either not fill the prescriptions or accept a different product that is less expensive, less effective, or one that has more side effects. I am sure that the pharmaceutical companies have gamed the system to make it harder for PBMs to deny claims on a scientific basis. They can do this by maximizing the number of FDA approved indications up front. In many cases that results in a product with multiple diverse indications so that the newer medication can be prescribed based on secondary indications. The physician, pharmacist and patient are left to deal with all of the unnecessary bureaucracy in between. I posted my interaction with a PBM sometime ago and named them in that post. I learned about the power of corporate America as a result of that post. The VP of the company involved called me the next morning and wanted information about the patient involved. One thing led to another but the bottom line was that I pulled that post as a result of that sequence of events. Since my position has not significantly changed since then, the companies involved here will remain nameless. Keep in mind that identical transactions occur tens of thousands of times per day in the United States as PBMs and pharmaceutical companies battle for the healthcare dollar at your expense. 1. NSA grade Internet surveillance system by the managed care cartel. 2. A reader wants to see me silenced because they disagree with my viewpoint or just dislike psychiatrists. They forwarded the link to the company named in my original post. 3. My reputation as a tireless crusader against managed care and all of its associated systems. Well not so much a crusader, but there have been some memorable moments. Like a conference where I was speaking out against managed care - rather vehemently only to have the VP of one of these organizations remark: "Dr. Dawson - don't you work for a managed care organization?" If I did - they never censored me. Back to the case at hand. I was called originally by a pharmacist and had no information about the situation. I had to call her back and ask for a fax. I got the fax and it contained the prescription and a number for the PBM. I called and got their endless and indecipherable telephone queue. After typing in the correct identification number 3 times and saying it once (I thought I would forgo the voice recognition system that is set up to not work) I was put on hold and connected with a human. He asked me to "verify" in a line by line manner all of the data already on the faxed form. After wasting those minutes he talked about pulling up the prior authorization points as though he was going to call in another person for that detailed process. After a long pause (I am sure that many of my colleagues lose it at this point) he asked me the indication for the drug. This drug has only one indication and I told him. He said: "It's approved." That sequence of events, taking a total of about 20 minutes would be enough to piss off any intelligent person, but then he said: "The office can call the pharmacy and tell them the prescription is authorized" I was momentarily confused and said "What office?" He said: "Your office." That's right. Here we have a sequence of events that starts at the pharmacy with the PBM telling the pharmacist that prior authorization is needed. The pharmacist has to talk to me twice on the phone and send me a fax. And I have to complete this waste of time by calling and acting like an agent of the PBM. Just to be sure that I wasn't being totally lied to I asked the pharmacist if it was true that the physician's office had to call and complete this sequence from hell. Her response was "It's about 80:20 from the doctors' offices." Call me a dinosaur. Call me a hot head. But this exercise in helping corporate America make more money, while taking valuable time away from me, my employer, my patients, and my family is an abomination and a manipulation. It can exist only in a country where corporate welfare is the rule of the day and conflict of interest is at all levels of government. From the perspective of corporate America prior authorization is a good way to get physicians and pharmacists to work for them for free. From the physician's perspective - it is a complete waste of time. Supplementary 1: Although the sequence of events listed above may sound incredible it is not. I have dealt with PBM telephone queues where there was no way out. You could not enter the numbers by keypad or say them through voice recognition. There was no way to speak to a human. I had to call the pharmacist back and explain that the prior authorization through the PBM was basically a sham and if the patient wanted the medication they would need to pay for it out of pocket. It would be a lot more honest if the PBM would just tell people: "We make money by denying your prescriptions and in an ideal world we would prefer to not have to pay for anything." But I guess that would be bad for public relations. A recent article in the New England Journal of Medicine adds some more epidemiological data to the issue of the treatment of geriatric depression. The centerpiece of the article by Ramin Mojabai, MD is a graphic that is a combination of data from the National Survey on Drug Use and Health or NSDUH and the U.S. National Health and Nutrition Examination Survey or NHANES. His central point is that the majority of people diagnosed with depression in primary care clinics do not meet diagnostic criteria for major depression. The actual numbers for the elderly are 18% of those diagnosed with depression and 33% of those diagnosed with major depression actually have a diagnosis of major depression as assessed by rating scales or structured interviews. 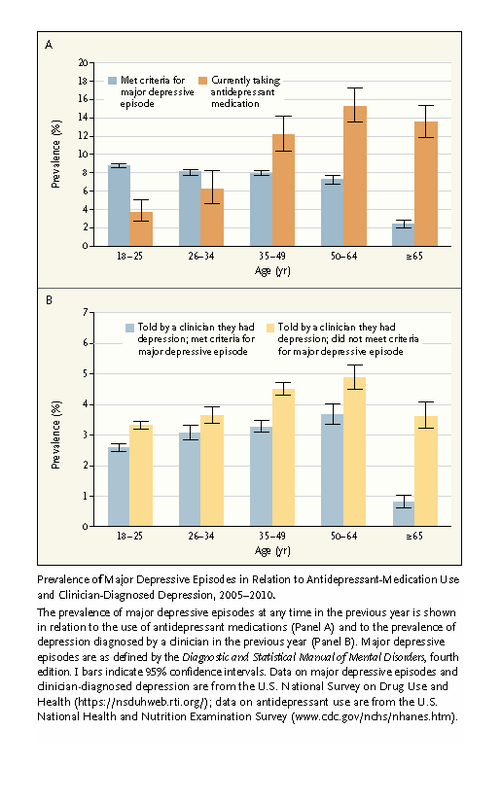 The bar graphs in the A panel illustrate that most people over the age of 35 who are taking antidepressants do not meet criteria for major depression. The opposite is true for the 18-34 year olds where antidepressant prescriptions are less than the prevalence of depression. Panel B illustrates that the prevalence of people who were told by their clinician that they had depression and did or did not meet criteria for major depression. In all cases the clinicians involved estimated non-major depression as being more prevalent than major depression. Can we learn anything from these graphs? The striking feature in Panel A is the dissociation of the total number of people taking antidepressants from the people with a diagnosis of major depression. I can see that happening for a couple of reasons. I would expect the number of people who are stable on antidepressant therapy to accumulate over time. Most of them would have major depression in stable remission and would no longer meet the criteria. A related issue is the atypical presentations of depression with increasing age. I have seen many cases of depression presenting as pseudodementia, Parkinson's syndrome, and polyarthritis or a similar chronic pain syndrome. In all cases, the symptoms responded to antidepressant medication but they would not meet criteria for major depression and most often the evaluation would resemble an evaluation for a medical problem. There is also the problem of depression in the aging population who have a form of dementia. At the upper end of this age distribution that may involve as many as 5% of the 65 year old population and they are likely overrepresented in primary care settings. Lastly there is the problem of suicide in the elderly. I reviewed a recent paper in the American Journal of Geriatric psychiatry that documented a decreased risk for suicide in elderly men and women who were taking antidepressants and the increased suicide risk in that group. It is likely that many primary care physicians are concerned about that higher level of risk and this may influence prescribing for this group. The other interesting comparison is that using different methodologies the ballpark antidepressant use in the elderly in Denmark approximates the antidepressant use on the US. It is probably a few percentage points lower, but the study in Denmark used a more robust marker of antidepressant use (refilling the actual prescription) rather than survey questions. The author addresses the issue of antidepressants being used for other applications like headaches and chronic pain chronic pain and states from an epidemiological perspective that two thirds of the prescriptions are for "clinician diagnosed mood disorder." The standard used in this study of DSM major depression criteria is too strict to use as a marker for antidepressant use since there are other valid psychiatric indications that primary care physicians are aware of and treat. Panic disorder, generalized anxiety disorder, social anxiety disorder and dysthymia are a few. There are also more fluid states like adjustment disorders that seem to merit treatment based on severity, duration, or in many cases by the fact that there are no other available treatment modalities. These are all possible explanation for the author's observation that the majority of people diagnosed with depression in primary care clinics do not meet criteria for major depression. Diagnostic complexity is another issue in primary care settings. Patients are often less severely depressed, have significant anxiety, may have an undisclosed problem with drugs or alcohol, and have associated medical comorbidity. In an ideal situation, a diagnosis of depression is not necessarily an easy diagnosis to make. It takes the full cooperation of a patient who is a fairly accurate historian with regard to symptom onset and dates. They are harder to find than the literature suggests. The epidemiological literature often depends on lay interviewers using structured interviews like the DIS or SADS to make longitudinal diagnoses. This approach will not work for a large number of patients and a significant number will not be able to recall events, dates, medications or prior treatments with any degree of accuracy. With that level of uncertainty, antidepressant prescription often comes down to a therapeutic trial so that the patient and physician can directly observe what happens between them as the only available reliable data. The author notes that the primary intervention for depression in primary care is the prescription of antidepressants. He talks about the ethical concerns about exposing patients especially the elderly to antidepressant drugs if it is not warranted, but he is using the major depression diagnosis here as the standard for treatment. He makes the same observation that I have made here that mass screening for depression is not warranted based on the concern about false positives. That stance is supported by the Canadian Task Force on Preventive Health Care. The U.S. Preventive Services Task Force recommends screening "when staff assisted depression care supports." My position is that screening, especially in medical populations is problematic not only from the false positive perspective but also because the screening checklist is often used as the diagnosis and an indication for starting antidepressant medications. Screening checklists are also political tools that are used to manipulate physicians. The best example I can think of is using serial PHQ-9 scores as a marker of depression treatment in primary care clinics even though it has not been validated for that application. As an extension of that application the PHQ-9 is used as a quality marker in clinics treating depression over time even though there is no valid way to analyze the resulting longitudinal data. The author makes recommendations to limit the overuse of antidepressants and uses the stepped care approach with an example from the UK National Institute for Clinical Excellence or NICE. These guidelines suggest support and psychoeducation for patient with subsyndromal types of depression. A fuller assessment is triggered by very basic inquiries about mood and loss of interest. Amazingly the PHQ-9 is brought up as an assessment tool at that point. More monitoring and encouragement is suggested as a next step with a two week follow up to see if the symptoms remit spontaneously. Medications are a third step for longstanding depressions or those that do not remit with low level psychosocial interventions. An expert level of intervention is suggested for patient with psychosis, high risk of suicide, or treatment resistance. That seems like a departure for NICE relative to their guideline for the treatment of chronic neuropathic pain. In that case the referral for specialty care was contingent on a specific prescribing consideration (opioids) and the pain specialist was considered the gatekeeper for opioid prescriptions in this situation. Antidepressants are seen as overprescribed drugs but no gatekeeper is necessary. I suppose the argument could be made that there are not enough psychiatrists for the job, but are they really fewer than pain specialists who prescribe opioids for chronic neuropathic pain in the UK? This model is only a slight variation on the Minnesota HMO model of screening everyone in a primary care clinic with a PHQ-9 and treating them as soon as possible with antidepressants. The driving factor here is cost. With a month of citalopram now costing as little as $4.00 - there is no conceivable low level psychosocial intervention that is more "cost effective". 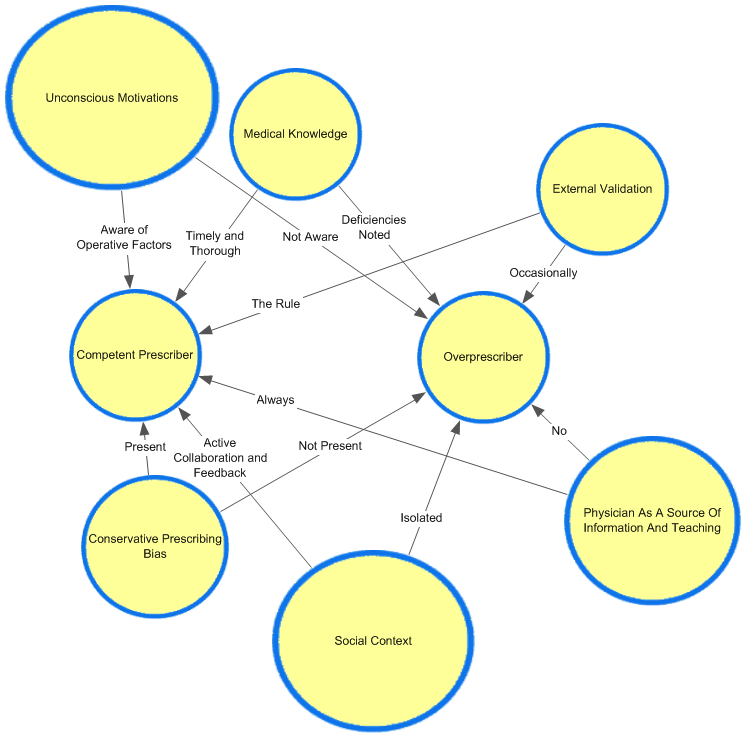 I have also been a proponent of computerized psychotherapy as a useful intervention and it is not likely that the Information Technology piece needed to deliver the psychotherapy would be that inexpensive. Another well known correlate of depression in the elderly is isolation and loneliness. I was not surprised to find that there were no interventions to target those problems since it would probably involve the highest cost. In the article standard research proven psychotherapies were recommended on par with the medical treatment of depression, but the question is - does anyone actually get that level of therapy anymore? My experience in assessing patients who have gone through it is that it is crisis oriented and patients are discharged at the first signs of improvement. That may happen after 2 or 3 sessions. I doubt that the stepped care approach will do very much to curb antidepressant prescribing. This study suggests that overprescribing is a problem using a strict indication of major depression. There are always problems with how that is sorted out. I have not seen any studies where a team of psychiatrists goes into a primary care clinic and does the typical exhaustive diagnostic assessment that you might see in a psychiatric clinic. It would probably be much more relevant to the question at hand than standardized lay interviews or checklists. There is also a precedent for interventions to curb over prescribing of medications and that is the unsuccessful CDC program to reduce unnecessary antibiotic prescriptions. If clear markers of a lack bacterial infection can be ignored, what are the chances that an abstract diagnostic process will have traction? And finally the stepped care interventions seem very weak. This is a good place for any number of professional and public service organizations to intervene and directly address the psychosocial aspects of depression in the elderly. Public education on a large scale may be useful. The psychoeducation pieces can be included in relevant periodicals ahead of time rather than as a way to avoid the use of medications. Environmental interventions to decrease isolation and loneliness is another potential solution. From a medical perspective, if the concern is medication risk every clinic where antidepressants are prescribed should have a clear idea of what those risks are and how to assess and prevent them. Patients who are at high risk from antidepressants should be identified and every possible non medication intervention (even the moderately expensive ones) should be exhausted before the prescription of antidepressant medication. Primary care prescribing patterns that potentially impact the patient on antidepressants should also be analyzed and discussed. A focus on risks and side effects can have more impact on the prescription of antidepressants than psychosocial interventions and waiting for the depression to go away. "From New England Journal of Medicine, Ramin Mojtabai, Diagnosing depression in older adults in primary care. Volume No 370, Page No. 1181, Copyright © (2014) Massachusetts Medical Society. Reprinted with permission from Massachusetts Medical Society."